This article looks specifically at products and how using microdata to mark-up your products on your website, for broader information on Schema.org mark-up code please follow the link. For extensive and definitive information on Schema.org please follow the link. Whatever your product or range of products, selling them online is typically critical to the success of the website. Microdata provides an advantage by structuring the pages with rich data that communicates to search engines what your products are, as well as a range of properties such as price. If your site is setup for eCommerce and sells products online, marking up those products with microdata can help Google to identify what those products are and a range of properties around them. 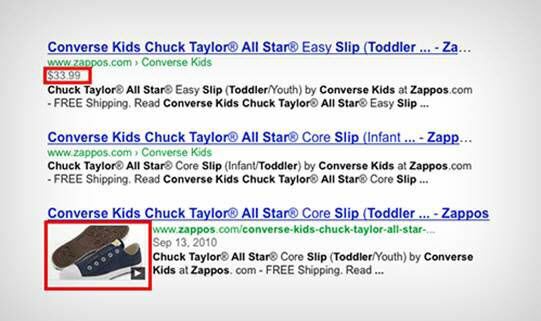 This can impact the SERPs (Search Engine Results Pages) as the image below illustrates how products can appear after having been marked up. As you can see, and this is indicative of all marked up SERP listings, this is a more comprehensive listing providing the searcher with more accurate and useful information with regards to products. There are a good range of properties that can assist in defining your products, below is a complete list of those specific to the itemtype of products. Other generic Schema properties can be used in conjunction with these, but this article focuses on just those detailed below. The brand(s) associated with a product or service, or the brand(s) maintained by an organization or business person. The colour of the product. The depth of the product. The GTIN-13 code of the product, or the product to which the offer refers. This is equivalent to 13-digit ISBN codes and EAN UCC-13. Former 12-digit UPC codes can be converted into a GTIN-13 code by simply adding a preceding zero. The GTIN-14 code of the product, or the product to which the offer refers. The GTIN-8 code of the product, or the product to which the offer refers. This code is also known as EAN/UCC-8 or 8-digit EAN. The height of the item. A pointer to another product (or multiple products) for which this product is an accessory or spare part. A pointer to another product (or multiple products) for which this product is a consumable. A pointer to another, somehow related product (or multiple products). A pointer to another, functionally similar product (or multiple products). A predefined value from OfferItemCondition or a textual description of the condition of the product or service, or the products or services included in the offer. A logo associated with an organization. The manufacturer of the product. The Manufacturer Part Number (MPN) of the product, or the product to which the offer refers. The product identifier, such as ISBN. For example: <meta itemprop='productID' content='isbn:123-456-789'/>. The release date of a product or product model. This can be used to distinguish the exact variant of a product. A review of the item. Supercedes reviews. The Stock Keeping Unit (SKU), i.e. a merchant-specific identifier for a product or service, or the product to which the offer refers. The width of the item. Arguably, the most important component of any TV is the image processor. Every TV has one and everything displayed on the screen must be processed by it before it appears on the screen. As you can see there is significant value to be had from marking up all of this content, without the microdata it will be readable by Google but Google will not necessarily know that the content is about a product that you sell. Defining all of these components can improve the way in which the products appear in the SERPS.